The vitamin D-resistant rickets was first documented by Albright et al., as early as in the 19th century itself. The pathophysiologic mechanism shared by them is the reduction in the phosphate reabsorption by renal tubuli which leads to hyperphosphaturia and hypophosphatemia, causing rickets. X-linked hypophosphatemic rickets (XLHR) is a familial syndrome characterized by the inadequate mineralization of cartilage and bone, consequent skeletal deformities, and growth retardation. The present case report shows the clinical, radiological, and pathological evaluation of familial hypophosphatemic rickets in a 9-year-old boy who came with the chief complaint of pain and missing tooth. A 9-year-old boy visited our hospital with the chief complaint of pain in the lower front region since 3 years and a missing tooth in the upper front region of the jaw since 1 year. The pain was mild and intermittent with occasional pus discharge. There was no eruption of the permanent tooth after the shedding of the deciduous tooth in the second quadrant of the jaw since 1 year. As per the parents' observations, the child had difficulty in walking since he was 3 years old and also bowing was observed in the extremities since 1 year. We could observe that the mother also had a limping gait and short stature. On further investigation, the mother revealed that she had undergone surgery for bow-leg deformity and multiple root canal treatments. The child has two elder sisters who are apparently normal and there was no contributing paternal history. General physical examination revealed that the height and weight were 114 cm and 18 kg, respectively, which are less as compared to the average height and weight of an age-matched Indian boy. The patient had a dolicocephalic face, frontal bossing, and incompetent lips [[Figure 1]a]. There was bowing of the arms and legs with enlargement at the wrist and the ankle joints [[Figure 1]b and c]. The presence of rachitic rosary, Harrison's groove, and lumbar lordosis was also noted. On intraoral examination, mixed dentition was present with the missing maxillary permanent left central incisor, grade II mobile mandibular deciduous left first molar, and mandibular deciduous right lateral incisor and decayed maxillary permanent right first molar and maxillary permanent left first molar, with fair oral hygiene [Figure 2]. Considering the familial history and the clinical features favoring rickets, the provisional diagnosis of familial rickets was made. The OPG showed decreased a cortical bone density in both the maxilla and mandible with thinning of the inferior cortical border of the mandible. 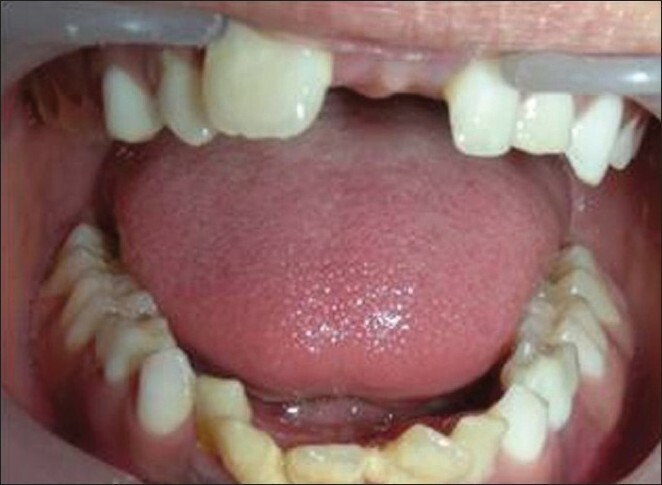 Both primary and permanent teeth showed taurodontism with a generalized diminished lamina dura [Figure 3]. 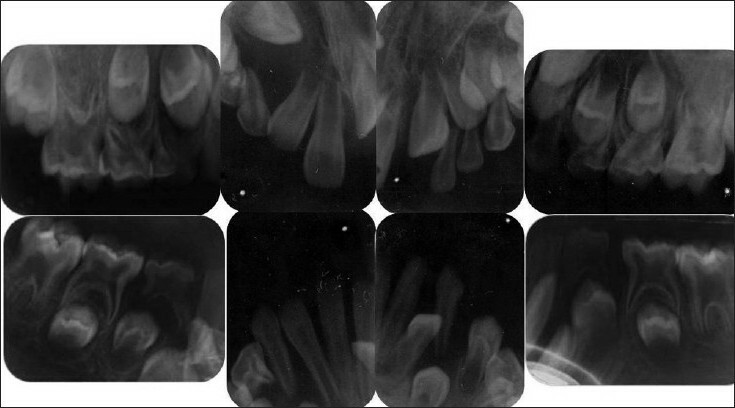 IOPA radiographs showed generalized taurodontism, reduced density of the enamel and dentine [Figure 4]. 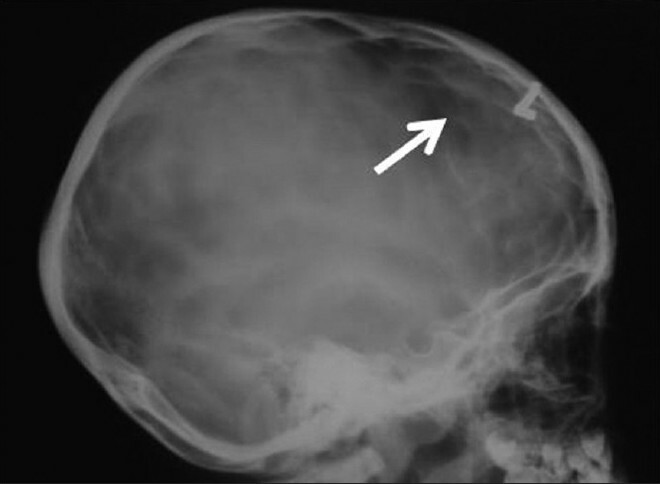 Frontal and lateral skull radiographs showed the presence of diffuse copper beaten appearance with premature closure of sutures [Figure 5] and [Figure 6]. The hand and wrist AP radiograph showed diffuse osteopenia in the form of coarse medullary trabeculae and endosteal resorption. The distal end of the radius and ulna showed metaphyseal splaying with widening of growth plates [[Figure 7]a]. A similar finding was observed bilaterally on the distal end of the femori proximal and distal metaphysis of the tibia and fibula [[Figure 7]b]. The femur showed the coxavara type of deformity [[Figure 7]c]. The chest radiograph revealed mild splaying of cartilaginous ends of ribs [[Figure 7]d]. All long bones showed bowing deformity. Sonography of kidneys was advised to rule out nephrocalcinosis, which came negative. One of the deciduous teeth was subjected to ground sectioning which revealed a large pulp chamber and numerous areas of interglobular dentine throughout the thickness of the dentine. The cementum was absent in the apical third, while only a thin layer was present in the cervical and middle third portion of the root. Observing these dental and skeletal findings, blood investigations were advised. The blood report revealed decreased serum phosphate, 2.6 mg/dL (normal range = 3.7-5.6 mg/dL), and elevated serum alkaline phosphatase, 514 IU/L (normal range = 150-380 IU/L); however, serum calcium was within the normal range, 8.5 mg/dL (normal range = 9-11 mg/dL). The decreased levels of serum phosphate show decreased absorption or increased renal wasting of phosphate, while the elevated serum alkaline phosphatase levels suggest an increased bone turnover. From the above history, clinical examination, and the investigations, we arrived at a final diagnosis of familial hypophosphatemic rickets. Initially, the dental management was done with oral prophylaxis, the restoration of decayed and the extraction of the mobile teeth. A neutral phosphate syrup, 15 ml, was prescribed with three divided doses daily for hypophosphatemia; also, vitamin D 0.25 ΅g was supplemented in once daily dose. The patient was subjected to physical therapy like cycling and exercise. On 6-month follow-up, the patient showed improvement in gait and physical activity. Initially, environmentally caused rickets was very common; however, when it was treated and prevented by public health measures, the vitamin-D-resistant rickets came into picture. Albright et al. highlighted that some of the patients with rickets did not respond to physiological doses of vitamin D and named the condition as vitamin-D-resistant rickets. Later studies showed that treatment of rickets was possible by vitamin D in doses higher than its physiological doses and eventually termed it as vitamin D refractory rickets. Fraser and Salter studied 13 cases of hereditary vitamin D refractory rickets. The hereditary forms were further divided into familial hypophosphatemia rickets and vitamin D dependency. The latter is caused by the deficiency of an enzyme 25-hydroxyvitamin D-1a-hydroxylase which is responsible for the synthesis of 1,25 dihydroxycholecalciferol. This substance specifically acts on the intestine to stimulate calcium transport. Therefore, the biosynthesis impairment of the vitamin D hormone causes calcium deficiency manifesting with signs of hypocalcemia and in later stages with hyperparathyroidism. Vitamin D dependency shows an autosomal recessive pattern. Clinical features include decreased vertical height, craniotobes, rachitic rosary, bowing leg deformity (genu varum) or knock knee (genu valgum), double malleoli sign of ankles, metaphyseal hyperplasia of wrist, and Harrison's groove on the chest. Costochondral junction shows cupping and splaying of rib ends. Spine shows scoliosis or lordosis and biconcave vertebral bodies. Pelvis shows triradiate appearance due to the inward migration of the sacrum and acetabula. 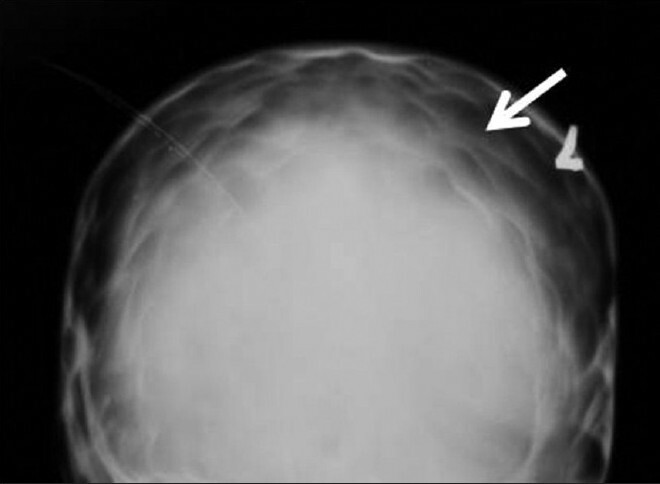 Ossification centers of the epiphyses show an indistinct outline. Diaphysis shows osteopenia, subperiosteal lucent lines tunneling, and bowing. Bowing deformity is common in the femur and tibia. The femur shows the coxavara type of deformity, wherein the neck makes an angle of less than 120° with the shaft of the femur. Being dentists we hardly come across this rare variety of rickets in our clinics. However, with thorough case history, systematic clinical examination, and appropriate investigations, it is possible to diagnose even rare diseases. In this case, though the patient presented with pain and missing tooth, we were able to diagnose familial hypophosphatemic rickets and treat the patient at its earliest. 1. Fraser D, Sciwer CR. Familial forms of vitamin D- resistant rickets revisited: X- linked hypophosphatemia and autosomal recessive vitamin D dependency. Am J Clin Nutr 1976;29:1315-29. 2. Chuan-Hsu Y, Ho-Chin PC, Yao-Hsu Y. Oral manifestations of vitamin D- resistant rickets: Case report. Chin Dent J 1997;16:250-5. 3. Francis F, Tim MS, Steffen H, Bo¨ddrich A, Lorenz B, Brandau O, et al. Genomic organization of the human PEX gene mutated in X-linked dominant hypophosphatemic rickets. Genome Res 1997;7:573-85. 4. Ji-mei SU, Yun LI, Xiao-wei YE, Zhi-fang WU. Oral findings of hypophosphatemic vitamin D-resistant rickets: Report of two cases. Chin Med J 2007;120:1468-70. 5. Hillmann G, Geurtsen W. Pathophisiology of undecalcified primary teeth in vitamin D- resistant rickets. Oral surg oral med oral pathol oral Radiol Endod 1996;82:218-24. 6. Abe K, Ooshima T, Lily TS, Yasufuku Y, Sobue S. Structural deformities of deciduous teeth in patients with hypophosphatemic vitamin D- resistance rickets. Oral Surg Oral Med Oral Pathol 1988;65:191-8. 7. Marc KD, Kenneth WL, Mark RH, John MH. Evalvuation of a role for 1, 25- dihydroxyvitamin D3 in the pathogenesis and treatment of X- linked hypophosphatemic rickets and osteomalacia. J Clin Invest 1980;66:1020-32.